realistic definition of dynamic functioning of the central nervous system which underlies various brain functions. challenge in the field of imaging data analysis . fied, interact within a highly distributed neural network. linked by large-scale reciprocal dynamic connections . temporally and spatially segregated brain activities. regions interacting in a coherent and dynamic way. tionships between several brain areas may be examined. on the history of its input. G. de Marco ET AL. functional connections assumed to exist between regions. detail of information hidden within the fMRI signal. sesses the dependence between voxel signals . tral domain is essentially resistant to these artefacts. between local field potential and vascular response . whole-brain data prior to the connectivity modeling stage. 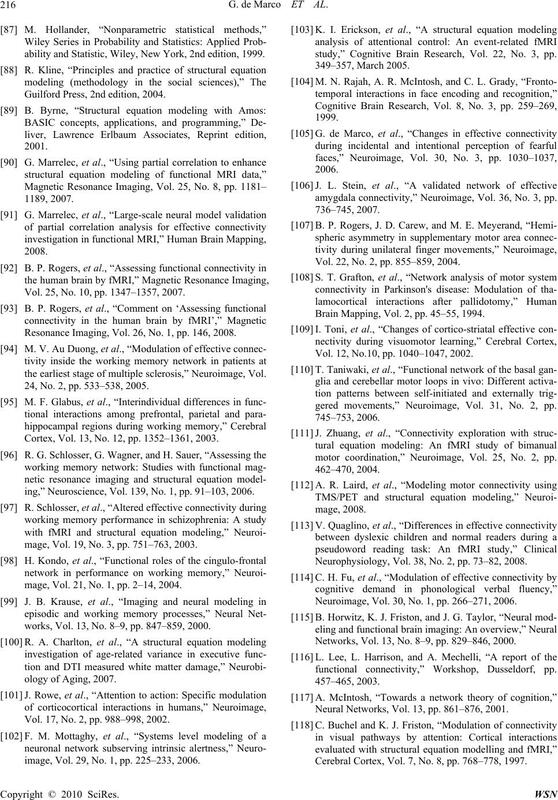 els [68,69] and large-scale neural models [70–72]. from analysis of the covariance among the variables. change over time and with respect to experimental tasks. connectivity when dynamic aspects can be disregarded. dynamics and connections between regions. explained as a linear combination of past data points. mutual predictability from past time points. whereas SEM only concerns the observed BOLD signal. data,” Center for Molecular Imaging Research, Vol. 2, pp. ence, Vol. 2, No. 4, pp. 229–239, 2001. Physiology Paris, Vol. 100, No. 4, pp. 171–181, 2006. Cerebral Cortex, Vol. 15, No. 8, pp. 1089–1102, 2005. Vol. 121, No. Pt 6, pp. 1013–1052, 1998. 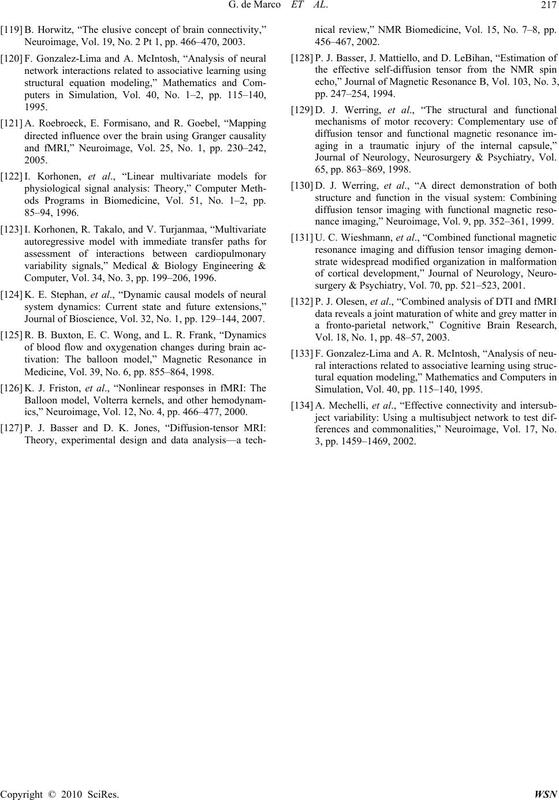 Trends in Cognitive Sciences, Vol. 2, pp. 474–484, 1998. Science, Vol. 8, No. 9, pp. 418–425, 2004.
neuroimaging: A synthesis,” Human Brain Mapping, Vol. tional brain imaging,” Human Brain Mapping, Vol. 2, pp. connectivity in physiological neuronal networks,” In: H.
Networks, Vol. 13, No. 8–9, pp. 871–82, 2000. Brain Function, 2nd edition, Elsevier, San Diego, pp. 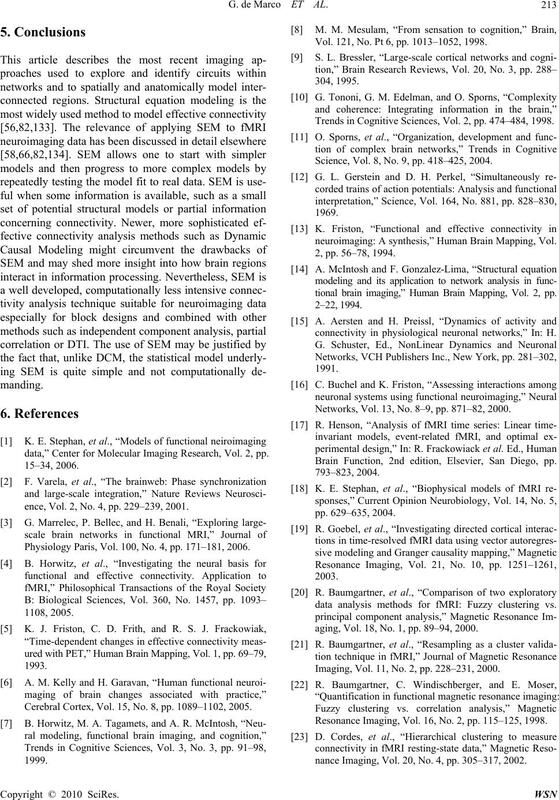 data analysis methods for fMRI: Fuzzy clustering vs.
aging, Vol. 18, No. 1, pp. 89–94, 2000. Imaging, Vol. 11, No. 2, pp. 228–231, 2000. Resonance Imaging, Vol. 16, No. 2, pp. 115–125, 1998.
nance Imaging, Vol. 20, No. 4, pp. 305–317, 2002. Neuroimage, Vol. 9, No. 3, pp. 298–310, 1999.
logical Cybernetics, Vol. 98, No. 2, pp. 101–114, 2008.
spectrum of fMRI data,” Neuroimage, Vol. 28, No. 1, pp. 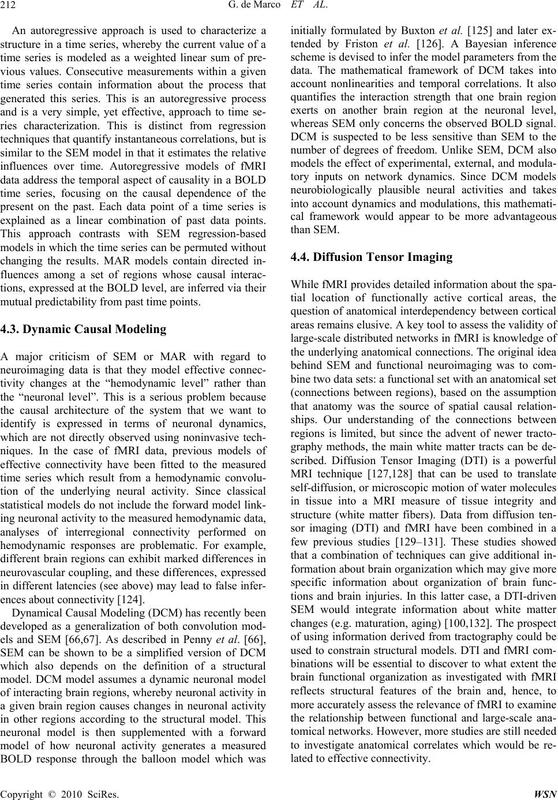 fMRI time series,” Neuroimage, Vol. 14, No. 2, pp. Neuroimage, Vol. 4, No. 1, pp. 16–33, 1996. Neuroimage, Vol. 34, No. 1, pp. 349–360, 2007. Vol. 25, No. 5, pp. 684–694, 2007. Neural Networks, Vol. 10, pp. 626–634, 1999. Mapping, Vol. 16, No. 3, pp. 146–157, 2002. Vol. 23, No. 2, pp. 137–152, 2004.
tions,” Human Brain Mapping, Vol. 6, No. 5–6, pp. Brain Mapping, Vol. 6, No. 3, pp. 160–188, 1998. Neuroimage, Vol. 25, No. 3, pp. 746–755, 2005. Vol. 21, No. 2, pp. 647–458, 2004. MRI,” Neuroimage, Vol. 12, pp. 366–380, 2000.
physiology, Vol. 98, No. 2, pp. 144–148, 1996.
tion,” Brain, Vol. 122, No. Pt 5, pp. 855–870, 1999. Brain Topography, Vol. 1, No. 1, pp. 46–54, 1988.
ology, Vol. 106, No. 3, pp. 229–237, 1998. Neurophysiology, Vol. 91, No. 3, pp. 232–233, 1994.
ology, Vol. 90, No. 3, pp. 242–245, 1994. No. 6843, pp. 150–157, 2001. Vol. 454, pp. 583–590, 1998. American Journal of Neuroradiology, Vol. 21, No. 9, pp. Cortex, Vol. 13, pp. 1352–1361, 2003. Vol. 14, pp. 655–666, 1994. Networks, Vol. 13, No. 8–9, pp. 871–882, 2000.
motor loops in vivo,” Neuroimage, Vol. 36, No. 4, pp. mage, Vol. 19, No. 4, pp. 1477–1491, 2003.
els,” Neuroimage, Vol. 22, No. 3, pp. 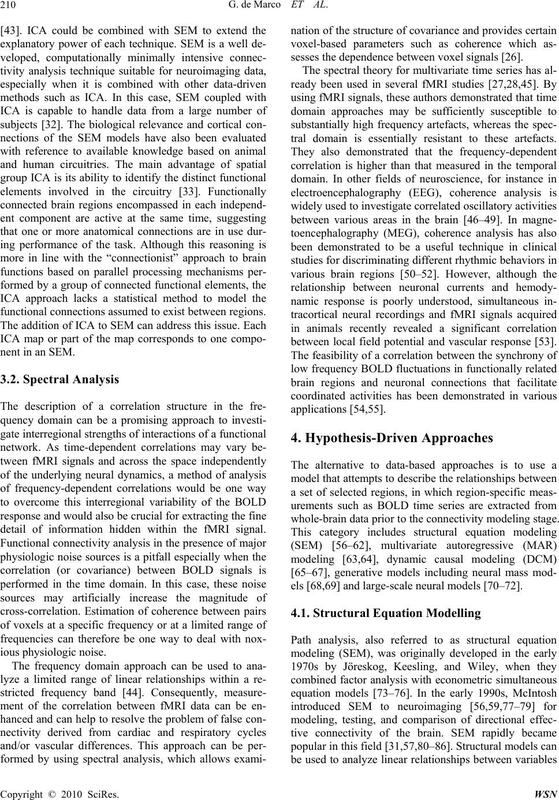 1157–1172, 2004.
causal modeling,” Neuroimage, Vol. 19, No. 4, pp. mage, Vol. 20, No. 3, pp. 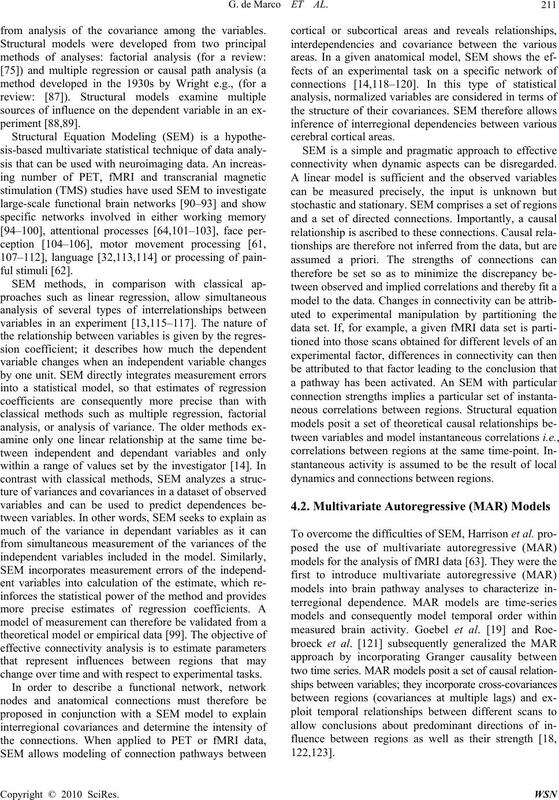 1743–1755, 2003.
neural mass model,” Neuroimage, Vol. 21, No. 2, pp. informatics, Vol. 2, No. 2, pp. 251–266, 2004.
mage, Vol. 21, No. 4, pp. 1701–1720, 2004.
human brain imaging study,” Cerebral Cortex, Vol. 8, No. rence Erlbaum, Mahwah, New Jersey, 1998.
and Research, Vol. 17, pp. 303–316, 1989.
els,” Sage, Thousand Oaks, California, 1993.
ology, Vol. 72, pp. 1717–1733, 1994. Science, Vol. 283, pp. 1538–1541, 1999. Cerebral Cortex, Vol. 7, No. 8, pp. 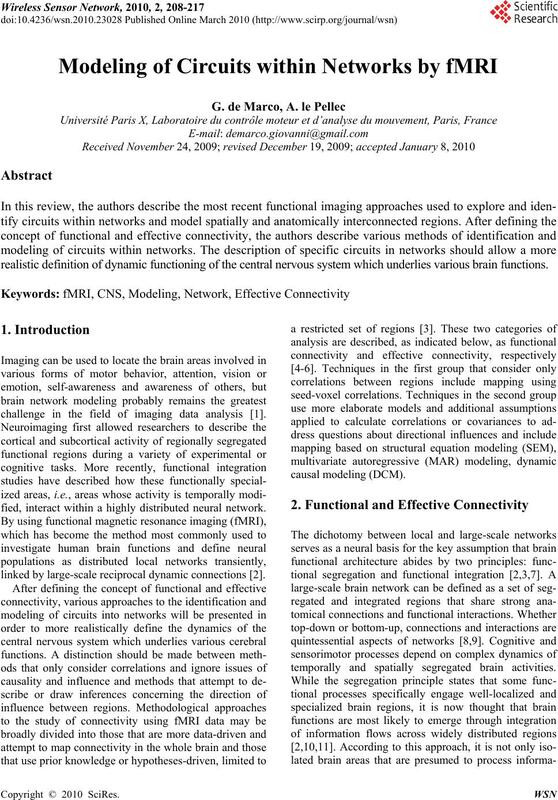 768–778, 1997.
analysis of fMRI data?” Neuroimage, Vol. 11, No. 4, pp. ing,” Cerebral Cortex, Vol. 9, pp. 168–178, 1999. Brain Mapping, Vol. 2, pp. 45–55, 1994.
image, Vol. 17, pp. 573–582, 2002.
mage, Vol. 7, pp. 244–254, 1998.
ability and Statistic, Wiley, New York, 2nd edition, 1999. Guilford Press, 2nd edition, 2004. Vol. 25, No. 10, pp. 1347–1357, 2007. Resonance Imaging, Vol. 26, No. 1, pp. 146, 2008.
the earliest stage of multiple sclerosis,” Neuroimage, Vol. 24, No. 2, pp. 533–538, 2005. Cortex, Vol. 13, No. 12, pp. 1352–1361, 2003.
ing,” Neuroscience, Vol. 139, No. 1, pp. 91–103, 2006.
mage, Vol. 19, No. 3, pp. 751–763, 2003.
mage, Vol. 21, No. 1, pp. 2–14, 2004.
works, Vol. 13, No. 8–9, pp. 847–859, 2000. Vol. 17, No. 2, pp. 988–998, 2002.
image, Vol. 29, No. 1, pp. 225–233, 2006.
study,” Cognitive Brain Research, Vol. 22, No. 3, pp. amygdala connectivity,” Neuroimage, Vol. 36, No. 3, pp. Vol. 22, No. 2, pp. 855–859, 2004. Vol. 12, No.10, pp. 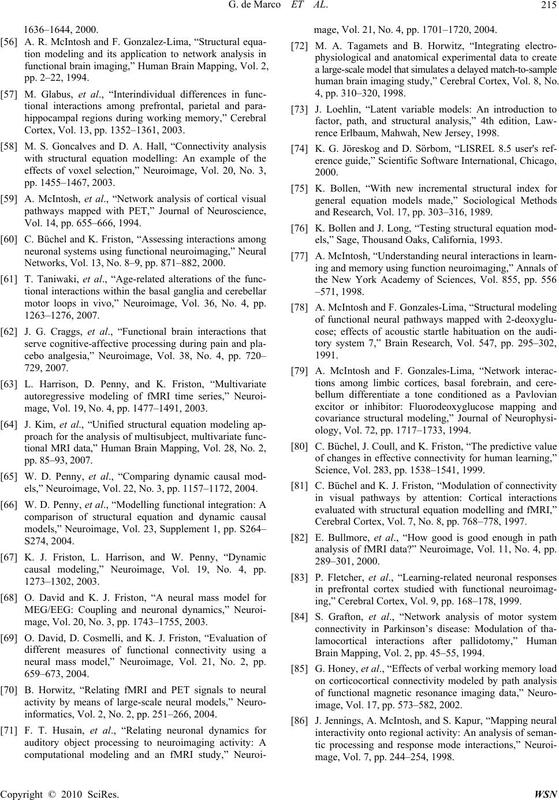 1040–1047, 2002.
gered movements,” Neuroimage, Vol. 31, No. 2, pp. motor coordination,” Neuroimage, Vol. 25, No. 2, pp. Neurophysiology, Vol. 38, No. 2, pp. 73–82, 2008. Neuroimage, Vol. 30, No. 1, pp. 266–271, 2006. Networks, Vol. 13, No. 8–9, pp. 829–846, 2000.
functional connectivity,” Workshop, Dusseldorf, pp. Neural Networks, Vol. 13, pp. 861–876, 2001. Neuroimage, Vol. 19, No. 2 Pt 1, pp. 466–470, 2003.
ods Programs in Biomedicine, Vol. 51, No. 1–2, pp. Computer, Vol. 34, No. 3, pp. 199–206, 1996. Journal of Bioscience, Vol. 32, No. 1, pp. 129–144, 2007. Medicine, Vol. 39, No. 6, pp. 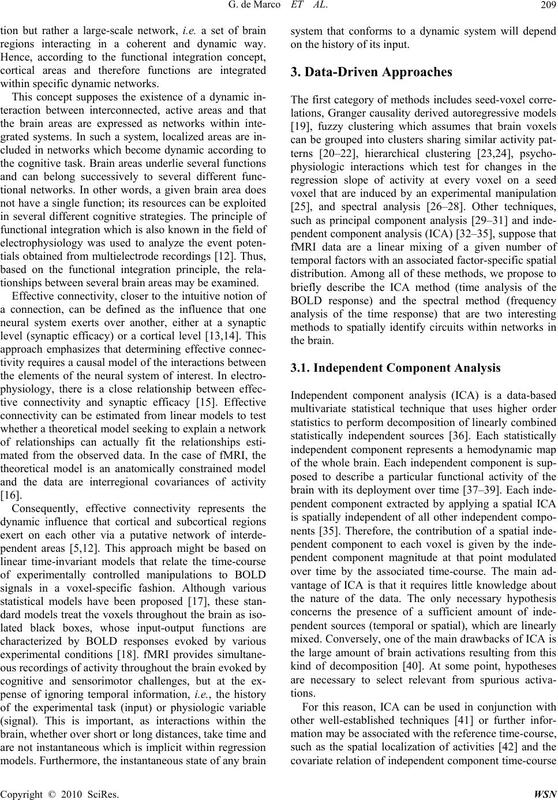 855–864, 1998.
ics,” Neuroimage, Vol. 12, No. 4, pp. 466–477, 2000.
nical review,” NMR Biomedicine, Vol. 15, No. 7–8, pp. Journal of Neurology, Neurosurgery & Psychiatry, Vol. nance imaging,” Neuroimage, Vol. 9, pp. 352–361, 1999.
surgery & Psychiatry, Vol. 70, pp. 521–523, 2001. Vol. 18, No. 1, pp. 48–57, 2003. Simulation, Vol. 40, pp. 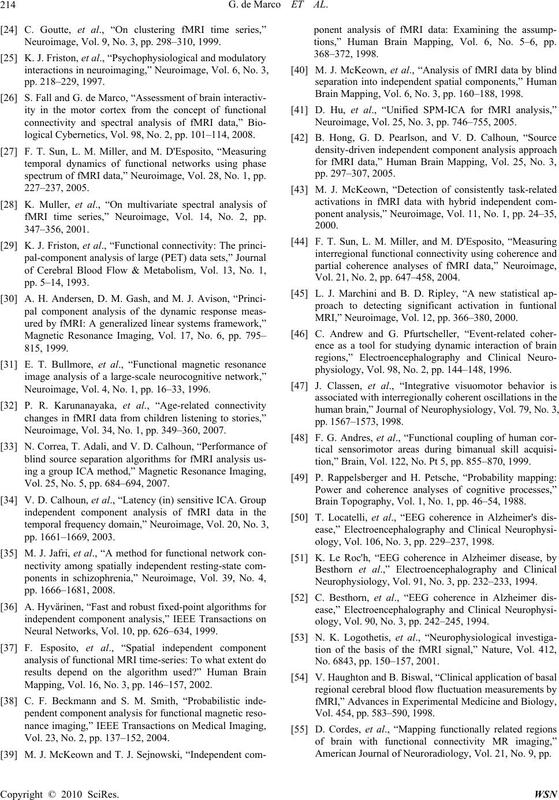 115–140, 1995.
ferences and commonalities,” Neuroimage, Vol. 17, No.